We Specialize in SWORDFISH! Book your SWORDFISH trip today! The Fighting Lady is a world famous 43' Merritt run by Captain Bart Sherwood. She is tournament ready with the finest of tackle and fish finding electronics. Captain Bart has been successfully charter fishing and capturing giant trophies for 25 years. The Fighting Lady travels worldwide throughout the Bahamas and Caribbean in search of giant blue marlin, giant bluefin tuna, and huge sharks. The boat is fast, air conditioned and has a nice clean head. We are conveniently located between Miami and Ft Lauderdale, Florida where we have great game fishing just 20 minutes from our dock. 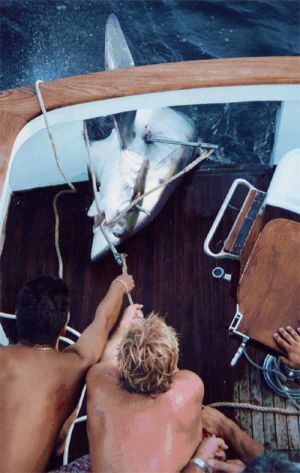 Here, we specialize in swordfish, sailfish, mahi mahi, big bottom dwelling wreck predators, kingfish and wahoo. Available also for giant bluefin tuna May thru June, Bimini, Bahamas; July thru October for blue marlin on the North Drop ST. Thomas USVI. Wes and Ray releasing a sailfish, Feb '06. While on your fishing trip, we have professional photography service as well as full taxidermy service available to have your trophy catch stuffed.